With many thanks to the Wood Norton Remembers project for this post. As ever if you or your local history group has any research to share please do get in touch. Thomas Walter Doughty was born in 1892, the son of Thomas George and Anna Maria Doughty. He was baptised on the 24th January 1892 in Wood Norton parish church. (see Figure 1). 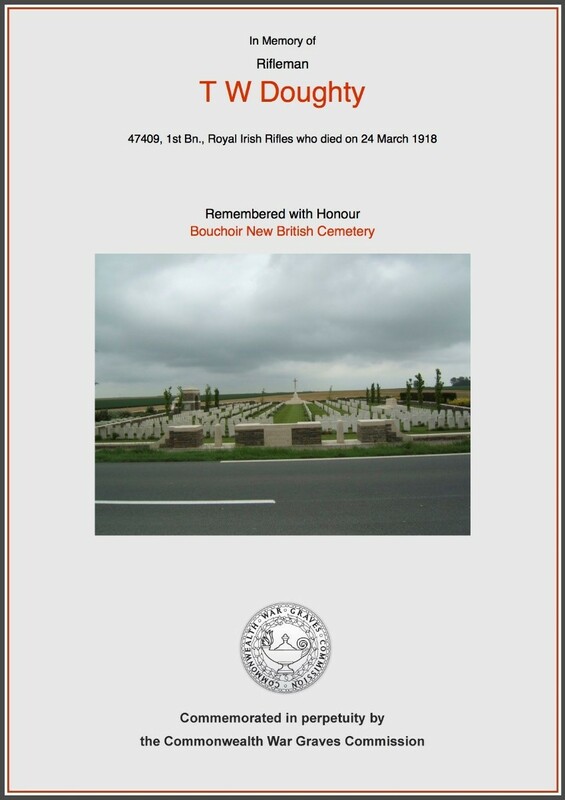 Whilst the British Army WW1 Service Records 1914-1920 do not appear to have survived for Thomas, there are some extant records that indicate that he served in two branches of the military – as a driver in the Army Service Corps (later the Royal Army Service Corps), and as a rifleman in the 1st Battalion the Royal Irish Rifles (see Figure 2). Thomas was serving with the Royal Irish Rifles when he was killed during the First Battles of the Somme in 1918. … observed as a holiday. 1st and 2nd Battalions united at Mass by Revd. F. Gill D.S.O, M.C. ; first time since 1854. Football match in morning. 1st Battn. 2 goals. 2nd Bn. 1 goal. … Battalion sports in afternoon. On the 20th March the men were working on the trenches in the Battle Zone and at Artemps. The Battle HQ moved from the village to Battle Dugouts in the Quarries, as a German offensive was expected to start the next morning, according to information received from prisoners. The offensive came at around 04.30am on the morning of the 21st March 1918, when the Germans launched operation Michael, with heavy bombardment near Saint-Quentin. The aim was to confront what was perceived as a weakened British Expeditionary Force (BEF); outflank it, attack the lines of communication and cut off the supply lines from the channel ports, thus defeating the British and forcing a French armistice. During these operations the following casualties occurred: 31 O.R. killed, 248 wounded, 155 missing. 9 wounded and missing – a total of 439. Following the fighting in March, Thomas’s parents presumably received a communication with the dreadful news that their son was missing in action. 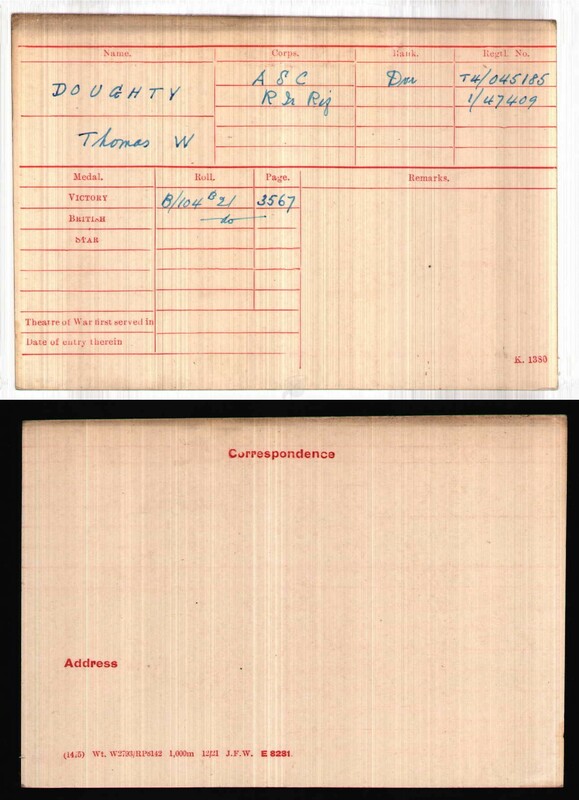 They wrote to the Red Cross (as many families of missing soldiers did) to seek help in locating their son, and the index card for Thomas survives in the International Committee of the Red Cross (ICRC) records (see Figure 3). 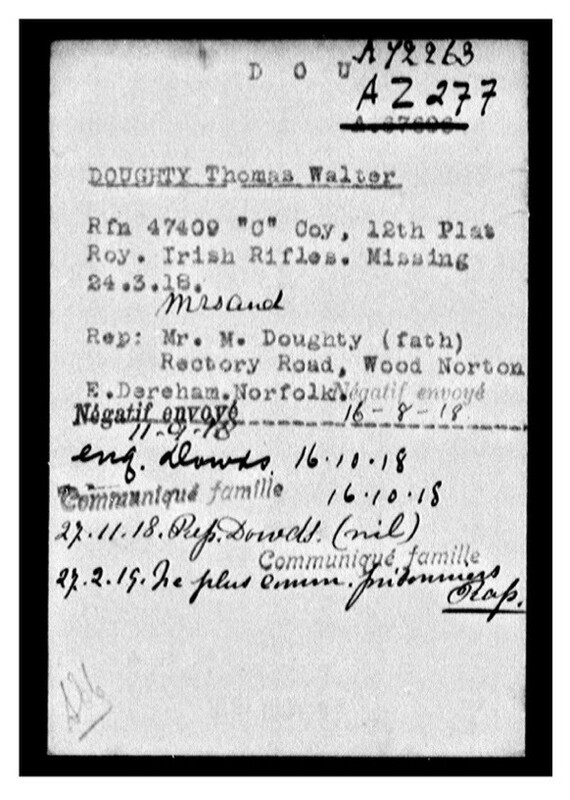 The card records the date Thomas went missing, his regimental details, and his parents’ address. It is stamped 14 AOUT 1918 (14th August 1918) on the reverse. The enquiries made by the Red Cross are listed on the card (in August, September, October and November 1918), but each came with the response ‘Négatif envoyé’ – the soldier was not registered as a prisoner, so there was, therefore, a negative response. The final communication with Thomas’s family was on the 27th February 1919 – ‘ne plus comm. prisonniers Rap’ (which may mean that there had been no further information received from repatriated prisoners). Thomas, had, in fact, been killed in March 1918, and his Record of Soldiers Effects drawn up in September 1919 records ‘Death accepted 24.3.18’. An amount of £39 13s 2d was paid to his father, Thomas George Doughty in March 1920, which included a War Gratuity of £18. 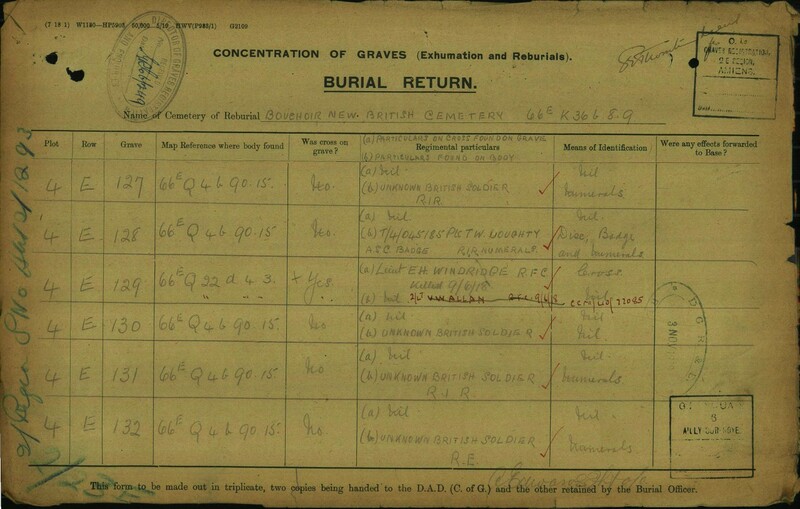 The Commonwealth War Grave Commission’s Burial Return dated 3rd November 1919 records that Thomas’s body was interred in Bouchoir New British Cemetery (see Figure 4). The Burial Return lists individuals who have been recovered or exhumed from their original burial location and moved to a particular cemetery. The return includes the original trench map grid reference, and indicates that Thomas had been buried in an unmarked grave; five out of the six men recorded on this return having been recovered from the same location. 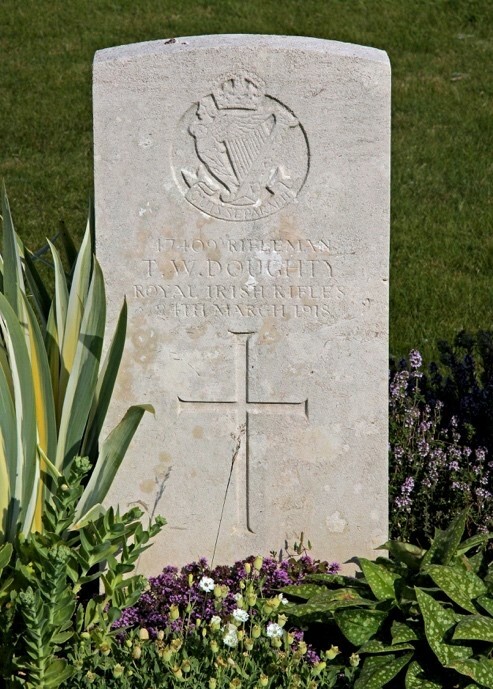 Thomas’s body was identified by his identity disc, Army Service Corps badge and Royal Irish Rifles numerals. The body was recovered from trench map grid reference 66E Q4b 90.15, near Erches, where the Battalion had been involved in fighting on the 26th March 1918 (which possibly might indicate that although Thomas’s death was recorded as being on the 24th March 1918, he may have died two days later). Further research into Thomas’s family reveals that his father, Thomas George Doughty was born in 1870 in Wood Norton, the son of Thomas and Martha Doughty. He married Anna Maria Waterson on the 9th January 1892 in Wood Norton parish church. In the 1911 census for Wood Norton, Thomas George is recorded as aged 40 and a farm labourer. He died in 1943, aged 72, and is buried in Wood Norton – the Burial register notes that he was living in the Council Houses (in Church Road) at the time of his death. Anna Maria Waterson was born on the 27th February 1874 and baptised on the 12th August 1877 in Stibbard parish church, the daughter of Mary Waterson. She died in 1945, aged 72, and is buried in Wood Norton. Thomas Walter 1892, in Wood Norton. In the 1911 census, Thomas is aged 19, and a farm labourer. 24 March 1918; France, the Somme. Rosalie Mabel 1897, in Wood Norton (baptised 2nd May 1897). In the 1911 census, Rosalie is aged 14, and at school. Bessie Edith 1899, in Wood Norton (baptised 21st March 1900). In the 1911 census, Bessie is aged 12, and at school. Bessie married Edgar Reynolds in 1924, and died in 1980, aged 80. Harold Charles 1902, in Wood Norton. In the 1911 census, Harold is aged 9, and at school. 1933, aged 31. Harold is buried in Wood Norton. The burial register transcript records that he was buried by Coroners Order following a fatal accident, and that he was living at 1 Council Houses. Hilda Grace 1910, Wood Norton. In the 1911 census, Hilda is 10 months old. Hilda married Thomas William Taylor on the 2nd April 1938, in Wood Norton. She died in 1987, aged 76, and is buried in Wood Norton. The burial register transcript records she was living at 1 Council Houses. 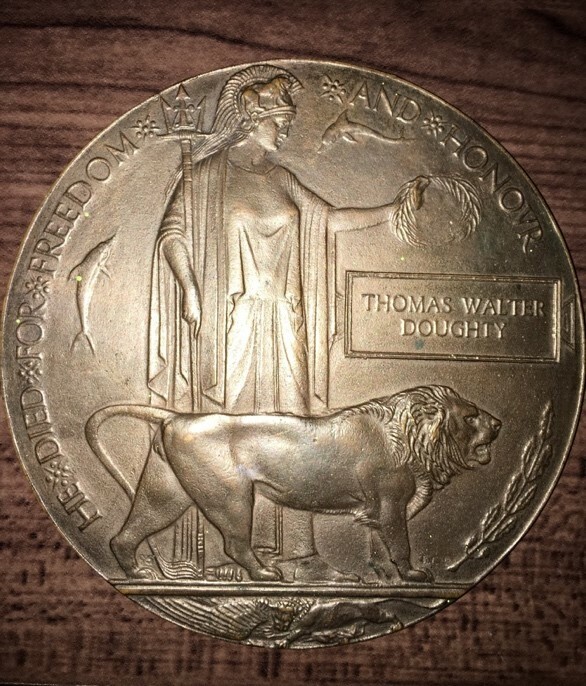 We have been fortunate to be able to contact Thomas Doughty’s family, and they have kindly provided us with a photograph of his memorial plaque (see Figure 6). FreeBMD, Quarter to March 1892, Aylsham B Vol.4b, p.143 (www.freebmd.org); Transcript and Index to Wood Norton, Norfolk, Parish Registers, compiled by Keith and Shirley Howell (February 2000), Marriages 1892 (p.97). This entry was posted in Family Reminiscence, research project and tagged Somme 1918, We Will Remember Them, Wood Norton Heritage Project. Bookmark the permalink.